I recently came into possession of an excellent French book on wallpaper: Françoise Teynac, Pierre Nolot and Jean Denis Vivien, Wallpaper: a history (English trans.Thames & Hudson, 1982), and thought I would base a few posts on it. Although the wallpaper industry developed first in England, the probability is that by the beginning of the 18th century century wallpaper was just as widely used in France, though comparative few examples survive. Wallpapers were produced by artisan shopkeepers – cardmakers, dominoteurs, paper merchants and wood engravers of all kinds. There was a long tradition of "dominos", marbled and coloured papers printed with wooden blocks on single sheets of paper, used in various decorative contexts such as lining papers and book endpapers as well as for walls. In the late 17th century these were joined by papiers de tapisserie imitations of luxury fabric and architectural elements such as wood panelling and plaster mouldings. The simplest designs were geometric repeating patterns requiring a single block, which were heightened with coloured size applied either by hand or through cut-out stencils. Wavy bands of images, mainly flowers and birds, could then be added. The more complex papers, which needed several blocks to complete, could be assembled in large decorative panels and included the newly-fashionable chinoiseries. Glued down and surrounded by printed borders and often with a top frieze with architectural motif or arabesque. There is a definite sense that wallpaper went up the social scale at this time. Savary des Bruslons in his Dictionnaire universel du commerce, described a "domino" as a "sort of tapestry on paper, which for a long time was used by the peasants and the poorer classes in Paris to cover the walls of their huts or their rooms and shops". In his 1713 version he was able to add that its production had reached a new high point of perfection and elegance: "there is not a house in Paris, however grand, that does not contain some example of this charming decoration, even if only in a wardrobe or other private room" (quoted, Wallpaper, p.22). 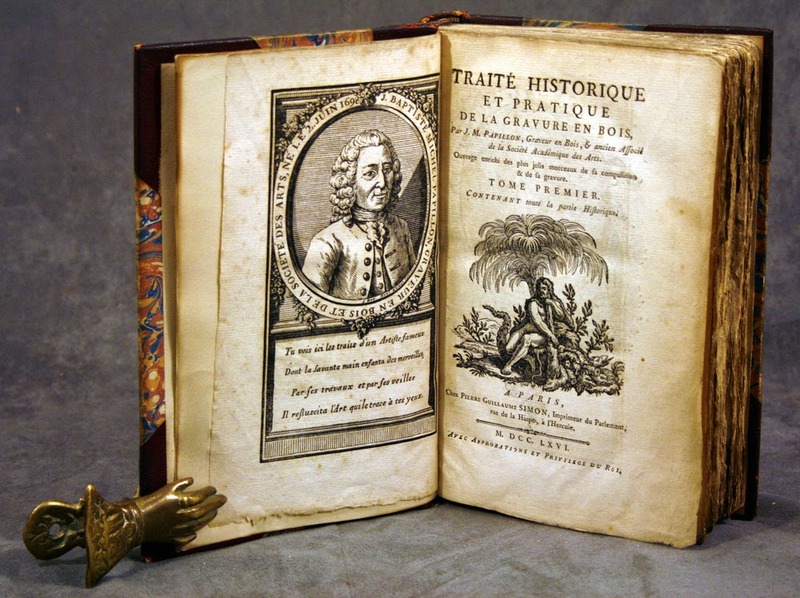 Most of the information early manufacture comes from Jean-Michel Papillon (1698-1776), author of a Traité historique et pratique de la gravure sur bois (1766) and the contributor of the article "Domino" to the Encyclopédie. Papillon was the third of a dynasty of wood engravers who from 1663 onwards owned a workshop in the rue Saint-Jacques near the St. Séverin fountain. Papillon's father Jean was the first and foremost of the Paris dominotiers. who, although he did not abandon general engraving and stationery work,successfully created a business specialising in wallpaper manufacture.According to manuscript additions to Traité , Jean Papillon is to be credited with a number of important innovations in manufacture. Whereas the old dominotiers had cut a pattern in a series of small blocks from a paper template, Papillon père used one plank of wood three feet long, sometimes drawing his design directly onto the wood. He also perfected the technique of "lustre" paper which was powdered over with ground up paints rather than brushed or stencilled. His key contribution, however, came in 1688 (or 1692) when he came up with the idea of printing from multiple blocks, so that sheets could be pasted together to form continuous patterns; according to his son he thus single-handedly launching the fashion for the much for ambitious and up-market papiers de tapisserie based on textile designs. It is clear that Jean-Michel himself , member of the Société des Arts, preferred "fine wood engraving" to the production of wallpapers and a few years after his father's death in 1723 he sold off the stock of the business and the wallpaper blocks to a widow named Madame Langlois. Very few of Papillon's wallpapers survive. Jean-Michel's manuscript "Oeuvres", now in the Cabinet d'Estampes in the Bibliothèque Nationale, give some examples but contain only seven sheets. They include his very first engraved design, a black outline of poppies made in 1707. Another, made for the "Royal Varnisher" Monsieur Martin, imitates figured velvet and there is also a large block for mosaic paper with flowers and butterflies in a scroll. A further design with complex motifs of flowers and mosaic was cut in 1727 for the sculptor Roumier, who designed it. Although Papillon's writings make it clear that his father's lead was rapidly followed, the wall paper business in the first half of the century remained closely connected with other printing and engraving trades. In Paris these were centred on the rue Saint-Jacques where shops in the arcades displayed merchandise under awnings and later glazed windows, whilst workshops behind opened out onto inner courtyards. Those involved in paper manufacture characteristically bound together by ties of inheritance, marriage and the bonds of master and apprentice. Designers were in heavy demand and seem to have moved fluidly between engravings for paper, tapestries and textiles. Other makers are known mainly from Papillon himself or from directories and newspapers. One of the most successful was Le Sueur, who had been an apprentice with Papillon, then set up as a rival with Vincent Pesant, Blondel and Pierre Panseron as his designers - the latter subsequently making his name as an architect and superintendant of construction for the Prince de Conti. Others involved were Roumier, who designed a number of fine plates of flowers and ornaments; Dufoucroy; and Jean Pillemont who designed famous Chinoiserie patterns for the Lyon silk industry. The Englishman John Baptist Jackson, who later set up in Battersea also travelled to Paris and learned his trade with Papillon fils. Others still are mere names: Masson and his successor Miyer; Basset, Forcoy, Vaseau and Goupy. In 1740 Madame Langois unsuccessfully disputed the right to use the sign "Au papillon" with the engraver Didier Aubert, who had set up a business selling wallpapers near the Hôtel de Saumur. Another notable dynasty involved in printing and wallpaper manufacture was the Chauveau family. It was Jacques Chauveau, Papillon's brother-in-law, who perfected the method of printing wallpaper à la rentrure, applying each colour from a separately engraved block using register marks (rentrées) for guidance. This effectively did away with the need for hand brushing and stencils. Chauveau used oil-based colours rather than the size favoured by English manufacturers, making his papers more more water resistant but without the prized matt finish. Geert Wisse, "Manifold beginnings" in The painted wall, ed. by Lesley Hoskins (2005), p.8-21. Clouzot was author of the standard work on wallpaper published in 1931, but I can't find his actual monograph online.